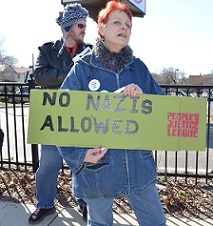 The neo-Nazi Patriot Front, was busy flyering down Indianola Avenue in Clintonville Monday, February 26 in broad daylight. 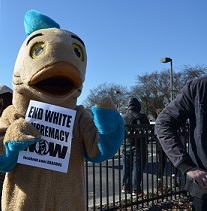 Whenever local residents removed them, the flyers would soon reappear. 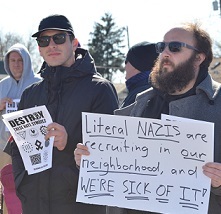 The neo-Nazis have now flyered Clintonville four times in the last few months in addition to Hilliard, Worthington, Westerville, and Dublin. 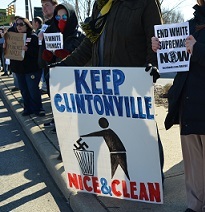 Clintonville activists and their allies made their values known with a large anti-racist demonstration Saturday, March 3, that drew about 60 people at the corner of North Broadway and High. 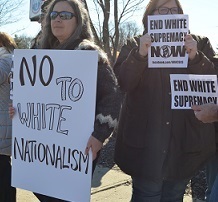 Here is a Patriot Front quote from Brakton Bragg, a Front leader: “This nation is the property of the founding stock and no one else.” I don’t suppose he’s referring to the Wyandot or the Ottawa founding stock of this land. On the flyer, they wrote: “Our goals do not end with a candidate in an office or a bill signed into law. Out horizon is set on absolute victory.” Hmmm. 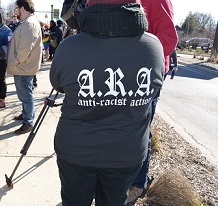 And even more violent language: “Resurrection through insurrection.